Domestic violence is on the increase in the UK. In addition to the personal trauma to individuals and families it’s costing this country alone in excess of £23 billion according to Police and Home Office sources. A British company, Lifelock Ltd, is set to help reduce the levels of violence and providing higher levels of protection. Much of the domestic violence occurs when both parties are living under the same roof or have access to the same property. And that’s where Lifelock can help. This small locking device, which has become a recognised safeguard in 50 countries worldwide, is simply fitted on the door, from the inside of a room, without the need for any keys or the use of codes. 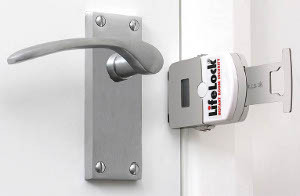 Lifelock is the brainchild of Hampshire based inventor, master locksmith and security expert, Joe Silver. He said: “Lifelock is easy to fit and can be installed and removed at choice in seconds without any need for permanent fixture. There is the added safety factor that your room cannot be accessed using a master or duplicate keys. Rosie Jacklin of the Nottinghamshire Independent Domestic Abuse Services recommends Lifelock. She said: “Women are especially vulnerable to domestic violence. Often permission of a landlord is needed to change locks and where a property is jointly owned the permission of the attacker world be required. “Changing locks also takes time and money. Lifelock solves these problems as it is instant not permanent and doesn’t damage the property in any way. Victims still have to go out and Lifelock can be carried in a pocket or handbag and being potable can be used in any property. Women visiting our Early Intervention Centre come through our doors as ‘high risk victims’ but with a combination of safety planning, an alarm and a Lifelock, go away with their risk level lowered. Lifelock is also used by international travellers and corporate organisations such as banks, blue chip companies and government bodies who are issuing them to staff who travel on their behalf in recognition of their duty of care and the potential risks. Joe Silver concluded: “Lifelock is ideal for anyone who is on the receiving end of domestic violence where a partner, of former, partner has access to the property. The user can sleep safely at night or simply seek refuge in a secure room until help can be summoned. At a small outlay of £35 per unit Lifelock gives peace of mind and can literally save lives. More information on Lifelock is available by telephoning 01420 549 829, emailing sales@lifelock.co.uk or by visiting www.lifelock.co.uk.